Such a simple little snack, and the salty smokiness of the bacon goes so well with the super sweet dates. A match made in heaven, for sure! If you want to take it to another level, try stuffing the date with a little bit of cheese before you wrap it - blue cheese, goat's cheese, cheddar, parmesan... it's up to you! I usually use 1/3 (or 1/2) slice of bacon per date, wrap it tightly and secure with a tooth stick. Bake at 200° until the bacon is crispy - about 10-15 minutes. Such a simple and beautiful looking dish. Hope tasty as well. Delicious! 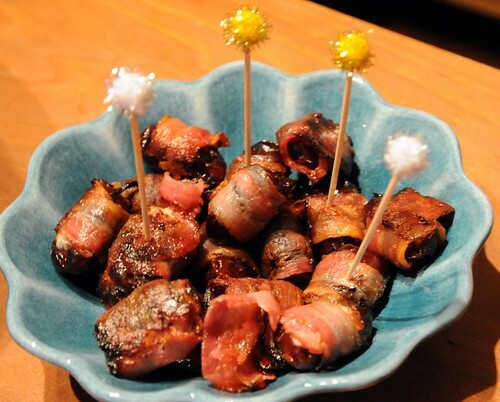 I also love Devils On Horseback, with prunes instead of dates. All good.